I'll cut right to the chase: The Pentel Vicuna Super Smooth Multi Pen + Pencil is an excellent pen. I want to make that point early on, because I didn't have high expectations of this pen going into it, but I was pleasantly surprised. In fact, I have had a hard time putting it down. My experience with the single cartridge Vicuna was completely fine, but not exceptional. I say not exceptional, but only in the fact that I would put it behind several of the Jetstreams and Acroballs I use so frequently. I'm not sure if it was the grip, or if the ink wasn't just right, but whatever it was, none of it bothers me in the multi pen version. I cannot find my original Vicuna to compare this one too directly, but first of all, the grip seems better on the multi pen. It is a little softer, more comfortable, and overall allows for a better gripping experience. The ink performance was better than I remembered as well. The lines were much cleaner and tighter, and there was no mess to speak of. And look how vibrant that red ink is! The Vicuna Multi Pen may never be a Top Fiver, but this is a pen I highly recommend. In fact, I have done so several times already. 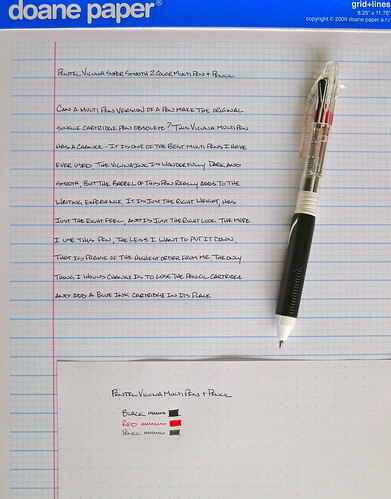 Posted on July 7, 2011 by Brad Dowdy and filed under Multi Pen, Pen Reviews, Pentel, Vicuna.